IMCO spent three years developing, testing, and racing the Xtreme Advantage Drive through the toughest conditions. Our A- 40 race boat along with other competitors in offshore series have racked up a lot of checkered flags, including world championships, with Xtreme Advantage drives. If you are looking for high quality, durable, serviceable and affordable outdrive, that can handle higher torque engines up to 600 HP, look no further! Only compatible with a full hydraulic steering system. Kit includes Gimbal assembly, Bellhousing, Coupler, Transom plate with bolt kit, Steering, Trim pump, Shift bracket, & Drive Oil Reservoir. For more information regarding the Gimbal Assembly see page 50. 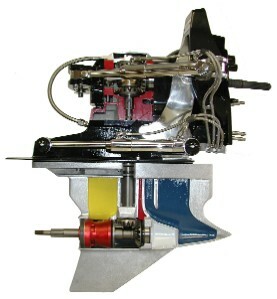 Kit includes Gimbal assembly, Bellhousing, Coupler, Transom plate with bolt kit, Steering, Trim pump, Shift bracket, Drive Oil Reservoir & Xtreme Drive. For more information regarding the Gimbal Assembly see page 50. Xtreme Advantage drives are available in, right hand/left hand combination and right or left hand drives. Lowers are available in Standard length, 1” and 2”. Optional Finishes - Satin, Black or Polished finished. Optional Xtreme 1-1/4 “ dia. prop shaft with prop adapter also available. requesting a Performance Drive that would handle more power at a reasonable price. IMCO did it again with the NEW Xtreme Advantage 1000. The XA 1000 will fit in place of any normal Bravo engine due to its revolutionary extension box that has thetransmission located inside. 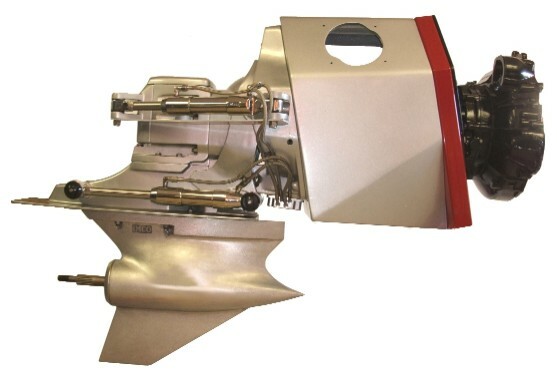 This allows you to have a drive that will handle up to 1000 HP without changing any of your boat configurations. The only 4-gear Bravo style drive on the market. Dual pinion gears equalize high torque loading. Twice as strong as standard single pinion gear drives. No clutch cone. • Integral smooth shifting, reliable Borg Warner transmission. • Engine placement remains the same. No loss of interior cockpit space. • Extensively tested in offshore competition, speed records and poker runs.